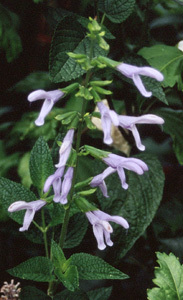 Joy Creek Photo Archive (c) all rights reserved Salvia guaranitica 'Argentine Skies' (Charles Cresson, 1990) is less tall and vigorous than the species. This long blooming perennial rewards us with its anise scented foliage and its spikes of sky blue. Summer to frost. 4 ft. x 18 in.